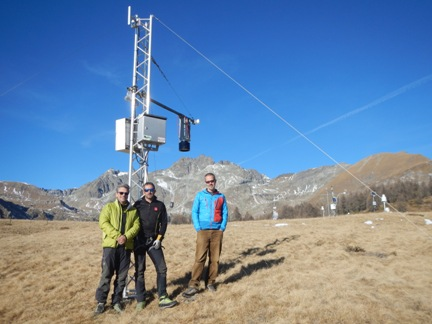 System integrator Hortus Srl installed a Campbell Scientific CS725 SWE (snow water equivalent) sensor in the northwest of Italy. The site at Tellinod (Municipality of Torgnon) lies at an altitude of 2,100 m (6,890 ft) above sea level and is already used for monitoring carbon fluxes. On this site the main measurements are conducted using the eddy-covariance method to assess gas exchanges across the ecosystem/atmosphere interface. This technique provides accurate and continuous measurements of the net ecosystem CO2 exchange (NEE) at an appropriate spatial scale. The CS725 installation, which is unique in Italy, is a field test of the sensor's capabilities before its final siting in a basin monitored by ARPA VDA, where it will be used in support of hydroelectrical production. The Agency developed specific mathematical models to simulate the snow melt during the summer and the entire hydrological cycle. The SWE data are used to calibrate and supply these models. The CS725 sensor passively calculates the snow water equivalent of a snowpack of up to a 60 m radius by measuring the attenuation of naturally occurring background gamma radiation emitted from the ground (Potassium 40K and Thallium 208 TI). The signal is attenuated according to the water content contained in the snow. The Hortus monitoring station, equipped with a CR1000 datalogger, collects and transmits SWE sensor data every six hours to both Hortus and ARPA servers via a mobile phone network. The link is realized with a GSM/EDGE modem called automatically through LoggerNet software, normally used by the Agency to collect data from several monitoring sites. There is a CR3000 dedicated to the eddy-covariance system. Additionally, there is an automatic weather station and an independent system for measurements of soil temperature and water content, both based on CR1000 dataloggers.